Alejandra Fuentes and her family decided to let the train take the strain when they went on holiday from Sweden last year to Torremolinos in southern Spain. Climate change concerns have prompted tens of thousands of Swedes to join a movement via Facebook. It is so popular that 500 are joining up every day. Sweden's best-known train traveller is Greta Thunberg - the 16-year-old climate activist who travelled 32 hours to Davos in Switzerland to take her message to world leaders. But many Swedes are travelling further still. The Fuentes' journey to the sun took a few days, but Alejandra's pre-school children were full of questions about the train-ferry between Denmark and Germany, the night-life in Hamburg and the morning rush-hour in Basel. "They became aware of changes as the journey continued," she says. Anna Hamno Wickman and her family initially cut down on flying because of climate concerns, and then discovered they had a better time when travelling by train. "We can read, rest, listen to audio books, play board games and also be transported to exciting destinations," she says. Last summer they went to Brittany in north-west France and in February they took the train to Berlin and slept in a tent. The Facebook group share stories and tips and discuss group travel. Since January last year, their numbers have swelled from 4,000 to 77,000. Carina Wellton joined the group and decided to travel alone, with her wheelchair, from Stockholm to Torrevieja in Spain. "I wanted to see if I could manage it physically," she says. She missed some of her connections because of the lack of wheelchair access. In Hamburg, she was stopped from boarding a train even though she had a ticket. In Lyon, she found herself on an empty platform with a broken lift and had to walk down the stairs to call for help. But the journey had its upsides too. While waiting in Hamburg, Carina sat herself down with a punk group on the street outside the station. "We drank beer and played our favourite music to each other," she says. "The whole thing became a small, improvised street festival. That was the first time I heard Russian punk." It is all part of Sweden's focus on climate change that has captivated society - politicians, artists and ordinary citizens. Every week, young Swedes gather outside parliament in Stockholm as part of the Fridays for Future campaign. More and more businesses are promoting trains in their travel policies. Sweden's left-of-centre coalition has even said it will look into starting up night trains to the continent again. And one of Sweden's biggest newspapers Dagens Nyheter, has chartered two trains for a train journey across Europe. Swedes have even coined some new words as this trend takes hold: flygskam (flight-shame), tagskryt (train-bragging), and even att smygflyga (to fly in secret). What's the Swedish word for moderation and balance? If you fancy a bit of flight-shaming, an Instagram account takes pride in naming and shaming Swedish celebrities posing in Los Angeles, the Mediterranean or Asia. On top of the celebs' glamorous images, aningslosainfluencers (clueless influencers) have slapped damning comments about carbon dioxide usage. 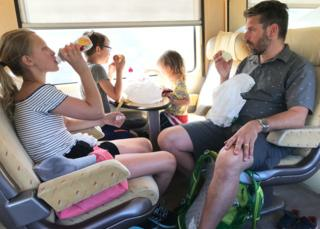 "Train holidays take longer and cost more, and they are super-trendy," says Johan Olofsson, a member of the train travel Facebook group. "All these stories about train adventures are of course social capital that you can use to show your best side for family, friends and at work." But on the whole they are not out to shame other people. "Choosing not to fly is a proactive act. Something positive. Making others feel ashamed is something else," says another group member, Ann Wiklund. Carina Wellton is also very aware that taking the train is often too expensive, and she considers "flight-shaming" unfair. "If you do, it becomes a class issue and something you brag about." Anna Hamno Wickman posts her family's rail adventures on Instagram to inspire others. "Social media is a catalyst for train journeys," Anna says. "We would have never dared to undertake our first long journey by train if we hadn't had the Facebook group as support. It has been amazing." The group's founder member, Susanna Elfors, has now started a charter service with a partner, designed around meeting other travellers, reading, playing games and hearing talks about their destinations. Her dream is to board an evening train from Stockholm to be greeted with a welcome drink and dinner. Passengers would wake up in Germany, stop off for a few hours in Alpine villages along the way before finally ending up on the Italian coast.